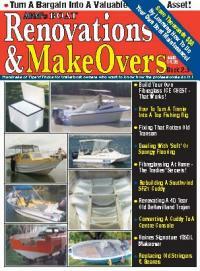 ABM's famous Boat Renovations & Makeovers Book 2 is now available online as a PDF download for permanent, 24/7 reference and/or printouts for just $14.95 rr, and $11.95 for current ABM Members. Check the Previews (just click �View Contents� under the cover picture ) for a full list of the features from this 156 page publication you�ll want to keep. The exceptional editorial line-up includes all your favourite DIY authors, including Tony Ravenscroft, (Yes, he�s here with his No 1 hit, �Building Your Own Ice Chest� and several other major DIY fibreglass reports) Neil Dunstan and Steve Jones, with special contributions from Tim Gilbertson, Darren Shiels and Ben Kincade. There�s no lack of variety in the 18 feature articles, either � R&M Book 2 covers everything from patching up a very old GRP transom to the full details of how Neil Dunstan transformed his 40 year DeHavilland Trojan into a very comfortable 2014 fishing cruiser . . Awesome 156 page book with proper easy to read magazine graphics to read on your computer, laptop, i-pad, android tablet or mini i-pad. The PDF magazine may be saved to your device then read or printed without internet connection. Buy this book now and it will download immediately! Distribution: The whole book with proper magazine graphics downloads immediately to your computer as a 11mb PDF file. Availability: The whole book downloads immediately as a PDF file which can be saved forever and easily printed. Description: Awesome, 11mb, 156 Page book to read on your computer, tablet or i-pad. PDFs may be saved and printed.